As the Premier League reached 10 years of compelling competition, Manager of the Decade Sir Alex Ferguson celebrated his own accolade in fitting style as Manchester United overcame an eight-point deficit from defending champions Arsenal to wrest back the title and hold aloft the Premier League trophy for the eighth time. Even though they paid a British record fee for England defender Rio Ferdinand from Leeds United, who replaced manager David O'Leary with Terry Venables in the summer, the Red Devils struggled to keep up with Arsene Wenger's Arsenal side in the early stages. Arsenal's north London rivals Tottenham Hotspur also started strongly, with new recruit Robbie Keane leading the line as they topped the Premier League table after four matches, but the Gunners took control and won seven of their first nine matches. The season's opening weeks also provided a couple of memorable local derbies. In September, goalkeeper Peter Enckelman let a throw-in slip under his foot and into the net as newly-promoted Birmingham City secured a 3-0 success against Aston Villa, while Paolo Di Canio scored a stunning volley in West Ham United's 3-2 win at Chelsea. 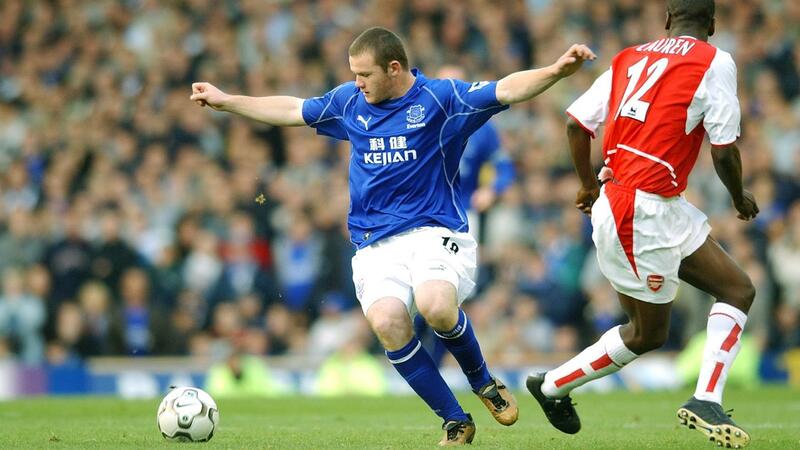 Premier League leaders Arsenal were finally unstuck by a memorable debut goal from 16-year-old Everton striker Wayne Rooney, who crashed a curling, long-range strike off the underside of David Seaman's crossbar to secure a 2-1 win in the dying moments of their encounter at Goodison Park in October. A defeat by Blackburn Rovers, whose attack was spearheaded by Manchester United's 1999 UEFA Champions League winning strike-force of Dwight Yorke and Andrew Cole, followed but the Gunners quickly topped the pile again after the prolific Thierry Henry scored a brilliant solo effort in a 3-0 win against Spurs in November. Their nearest rivals at this point were Liverpool, who started the Premier League campaign with a 12-match unbeaten run, but an alarming run of 11 matches without a win followed as they slipped out of the top four. 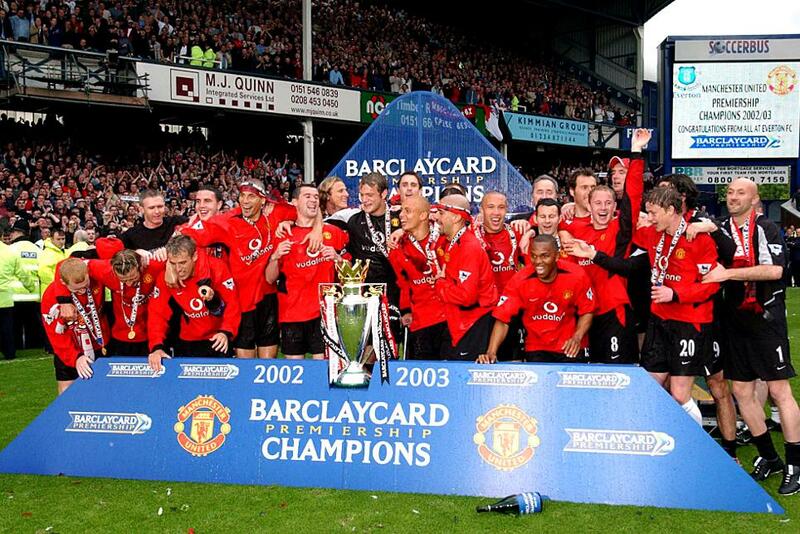 The latter months of 2002 also saw struggling Sunderland replace manager Peter Reid with Howard Wilkinson, while newly promoted Manchester City, with former Arsenal frontman Nicolas Anelka and ex-Manchester United goalkeeper Peter Schmeichel in their ranks, won their last ever Manchester derby clash with United at Maine Road. On Boxing Day, United suffered their final league defeat of the season as Middlesbrough, who had signed Brazilian playmaker Juninho for a third time in the summer, won 3-1 at the Riverside Stadium. At the turn of the year, Arsenal were five points clear of United and Chelsea, inspired by the form of veteran playmaker Gianfranco Zola, and that lead stretched to eight points over United in March.Shaun Goater scored twice as City beat United 3-1 in an impressive farewell season for their famous old ground. Their move to the Etihad Stadium was tinged with sadness though, as on-loan midfielder Marc Vivien-Foe, who scored City's last goal at Maine Road, tragically passed away after collapsing during Cameroon's Confederations Cup semi-final win over Colombia in June 2003. Ferguson's side enjoyed a remarkable turnaround and emphatic four-goal victories over Liverpool and Newcastle United helped them go into their crucial clash with Arsenal three points above the Gunners, having played one match more. Goals by Ruud van Nistelrooy, who netted 47 times for club and country during the 2002/03 campaign, and Ryan Giggs earned the visitors a 2-2 draw. United finished with four wins on the spin and Arsenal's Premier League title hopes were ended when Leeds, now managed by former Sunderland manager Reid after Venables' departure, won 3-2 at Highbury. Manchester United's No 7 shirt was vacated following their title triumph as David Beckham joined Real Madrid, while his predecessor Eric Cantona was named as the Best Overseas Player in the Premier League's 10 Seasons awards. Newcastle United striker Alan Shearer was named Player of the Decade, and the former England international scored 17 goals as the Magpies secured UEFA Champions League football. The pick of his goals that season for Newcastle, who were long in the title race until three successive defeats in April, came when he scored an unstoppable volley against Everton in December. The battle for the fourth UEFA Champions League spot was decided by a final day showdown between Chelsea and Liverpool, who were level on points going into the match. Jesper Gronkjaer's long-range strike earned Chelsea a 2-1 win, and a takeover from Russian billionaire Roman Abramovich followed that summer. 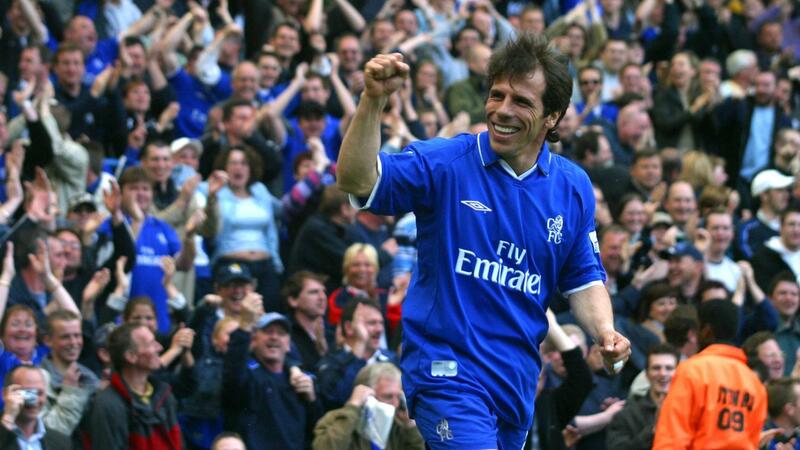 Chelsea's highest scorer was the 36-year-old Zola, who netted 14 league goals before calling time on his memorable Premier League career. The Italian forward scored 59 league goals for the Blues in seven seasons at Stamford Bridge. The fight for safety was also undecided going into the final day, as one of Bolton Wanderers and West Ham would join already relegated West Bromwich Albion and Sunderland. The teams were level on points going into the last match, but Bolton had the advantage with a superior goal difference. Goals by Per Frandsen and Jay-Jay Okocha gave the Trotters a final day win over Middlesbrough, whilst West Ham drew with Birmingham. The results meant that the Hammers went down with 42 points – the highest total for a relegated team in Premier League history.